Facebook is plastering posters around its headquarters to encourage employees to get rid of their iPhones in favor of Google-powered Android smartphones. According to a TechCrunch report, posters encouraging employees to "switch today" have started to appear on the walls at the social network giant's Mountain View, California offices. Facebook had previously offered its employees iPhones, but the aim in the switch to Google's mobile platform is apparently due to improved functionality for the Facebook app. The application present on Apple's smartphone has been criticized for being slow, draining battery life and not offering useful features. Thus, employees are being encouraged to use their own devices in order to improve the Facebook experience on the smartphone OS with the largest marketshare (Android currently dominates the market with a 72.4 percent share, while iOS decreased its hold on the market with a 13.9 share). 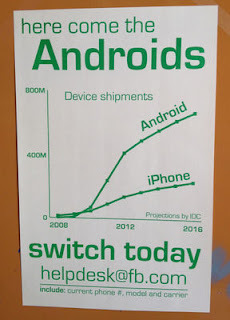 One of the posters in question features a graph depicting IDC data that forecasts Android will control around twice as much of the smartphone market as the iPhone come 2016. 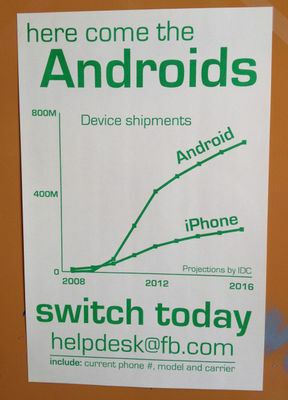 The posters encouraged employees to contact Facebook's help desk to have their device switched from iPhone to Android. Back in August, reports emerged that said Facebook employees were being "nudged, cajoled, and even ordered to give up their iPhones for Android devices." When asked about the posters, a Facebook spokesperson stressed: "We don't encourage one device over another. We let employees choose." During its announcement that Facebook boasts over a billion members, the company also confirmed it has over 600 mobile million users.